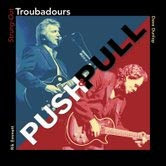 Here is the new CD by the Strung-Out Troubadours called "Push & Pull" ready to be released on May 26, 2009. The Troubs are Rik Emmett and Dave Dunlop and these guys rock! Check out Rik and Dave playing Gibson Les Pauls plugged into Traynor Custom Special Series All-Tube guitar amps. "I have got to get me one of these!!!!!" I want to buy a new guitar amp and now I will have to try out one of the Traynor models. Just listen to the sounds that Rik and Dave are getting from these amps! Totally awesome tone!